It is that time of year again, time to go into your closets and dig out those dresses for Dressember! 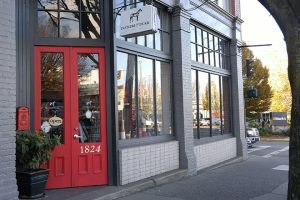 To prepare I thought I would share with you my favourite consignment shops in Victoria BC. Consignment shopping is one of the best ways to not only save money but to stop clothes from filling landfills and child slave labour, in other words, fast fashion. So much child and slave labour happens as a result of “fast fashion” Of the 170 million children engaged in child labour, many of them are making textiles and garments to satisfy the demand of consumers in Europe, and North America. 11% of the world’s children are in situations that deprive them of their right to go to school without interference from work. My first tip is to go through your closet and see what you have. You do not need a lot of dresses to participate in Dressember. You probably do not have a lot of different pairs of pants. Likewise you do not need a lot of different dresses. You can style one dress many different ways across different weeks. You can dress down your fancier dresses with a jean jacket, a sweater or a vest. Once you see what you have you have you can see what you wear the most. These are the garments that you want to be on the look for. Also see where the holes are in your wardrobe. What are the staple pieces that would help you wear your dresses through Dressember? They are well curated, organized by size and colour and easy to find what you are looking for. I rarely leave disappointed. I came away this from my tour of Victoria´s consignment, vintage and thrift shops with some excellent finds this time to help me layer up for Dressember.